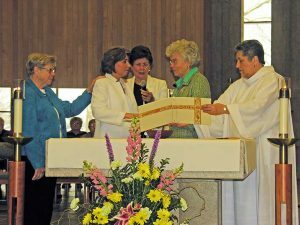 April 14, 2016, Adrian, Michigan – The Adrian Dominican Sisters continued the joy of the Easter Season in April with the Profession of Vows of three Sisters. Sisters Salvacion (Salve) B. Valenzuela, OP, left, and Alma D. Zapanta, OP, professed their final vows on April 3, 2016. Sisters Salvacion (Salve) B. Valenzeula, OP, and Alma D. Zapanta, OP, professed their final (perpetual) vows on April 3 during a special liturgy at the chapel of Our Lady of Good Counsel Seminary, on the same grounds as their Chapter house in San Fernando, Pampanga, the Philippines. The Most Reverend Paciano B. Aniceto, DD, Archbishop-Emeritus of San Fernando, presided. 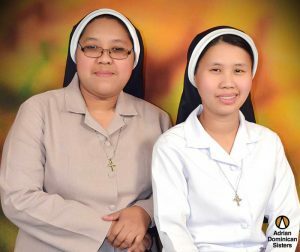 Sisters Salve and Alma are members of the Adrian Dominican Sisters’ Our Lady of Remedies Mission Chapter, based in the Philippines. They had both entered the Dominican Congregation of Our Lady of Remedies before that Congregation merged with the Adrian Dominican Sisters in November 2011. Sister Salve entered the Our Lady of Remedies Congregation in 2007 and professed her first vows on September 18, 2010. While preparing for her final vows, she ministered at Mother of Good Counsel Center for Abused Children/Women. She is also analyzing data for her thesis for her master’s degree in educational management from University of the Assumption, San Fernando. Sister Salve also holds bachelor’s degrees in nursing and in elementary education. Sister Alma entered Our Lady of Remedies Congregation in 2006 and professed her first vows on April 24, 2010. While preparing for her final vows, she ministered part-time as a Catholic school canteen coordinator. She earned her bachelor’s degree in education from University of the Assumption in 2013. Sister Marilín Llanes, O.P., professes first vows to Sister Attracta Kelly, O.P., Prioress. Looking on are Sisters Mary Jane Lubinski, O.P. (left); Rosa Monique Peňa, O.P. (center); and Marilyn Barnett, O.P. (right). Sister Marilín Llanes, OP, currently a school psychologist with the Joliet (Illinois) School District, professed first vows with the Adrian Dominican Sisters during a special Liturgy held April 10, 2016, at St. Catherine Chapel at the Adrian Dominican Sisters’ Motherhouse. Father James Hug, S.J., priest chaplain at the Motherhouse, and Father Thomas Saucier, OP, presided. A member of the Adrian Dominican Congregation from 1988 to 1995, Sister Marilín entered the discernment process for Readmission on August 8, 2015, the Feast of St. Dominic. A native of the province of La Habana in Cuba, she immigrated to the United States at the age of six with her parents, Nancy and Ricardo Llanes. Sister Marilín grew up in the Miami area and earned a bachelor’s degree in business administration from Barry University, sponsored by the Adrian Dominican Sisters. She holds a master’s degree in counseling from St. Mary’s University and a graduate degree in school psychology from Trinity University, both in San Antonio, Texas. Having served as a school psychologist in the Northside Independent School District in San Antonio, she has recently brought that ministry to the Joliet School District.